Boss lady of Metanorn and an animanga enthusiast with a varied taste. Aniblogosphere is where I reside mostly, running Metanorn, hosting MetaVerse and coming with new post and project ideas.
.: Lot's happening at Metanorn :. What is your favorite anime and Favorite Male and Female Character? Hello, madam. Btw. glad you like FMA and GTO. I hope you have a nice day. Are we doing the KnK watch this weekend? Well, it looks like it's that time of year again, so HAPPY BIRTHDAY!. I noticed you are watching Fate/Kaleid Liner Prisma Illya. I just finished it and all I can say is that episode 6's battle scene is EPIC!!!! I can't remember seeing a better one than that. I gave the series an 8. It's been awhile. I know we are both busy people, so we do what we can. I just got home from my 3rd anime convention....Kumoricon in Vancouver, WA over Labor Day weekend. I had a good time. 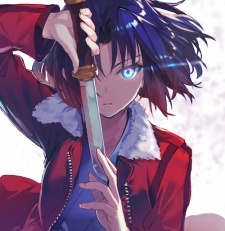 You know that I am a Type Moon fan, as are you, and I am always on the lookout for stuff about/by them. I found 2 books at the con. One was a 10 Anniversary of Type Moon with art from everything they have done. It's quite rare and I was happy to get it. I also bought a hard to get Fate/Zero vol. 1 artbook. Both are gorgeous and I will enjoy the pictures even if I can't read Japanese. Speaking of gorgeous, 3 cons and all had at least 1 Saber. The one at Kumoricon was the best I've ever seen, live or photo. She was @ 20, blonde (natural) and had hair long enough to do the braided circlet of hair. She was also very attractive. Her costume was stunning. Unfortunately, I was in the middle of checking into the hotel and could not get her picture. I looked for her all 3 days and no luck. I mean, she was as Saber as Saber would be. She and her cosplay will be unforgetable for me. She was that PERFECT. I'm back into the anime/manga & MAL world.. what I miss? What are you enjoying this season? I've only seen Makai Ouji and its becoming my guilty pleasure. Teehee. My profile just wouldn't be complete without some Joestar muscle. Shin Sekai Yori was a show that was good, but missed being great. Other than Saki, most characters vanish during the story, so it's hard to keep contact with the story. The best character was the queerat who was the villain in the story. Also, there were a couple glaring inconsistencies near the end and that really lowered it for me. I did give it a 7. I'm watching Psycho-Pass now. It is OK, but I don't see why all the ballyhoo over it. To me it seems like a standard cop show with some sci-fi stuff thrown in. Reminds me a lot of Minority Report, one of the few Tom Cruise films I actually liked. I have a list of Spring titles, but I think what I wrote before is about it for me. Still, you never know with me. I'll check out Metanorn's list today. Thanks for the heads up on the Kara no Kyoukai PV.